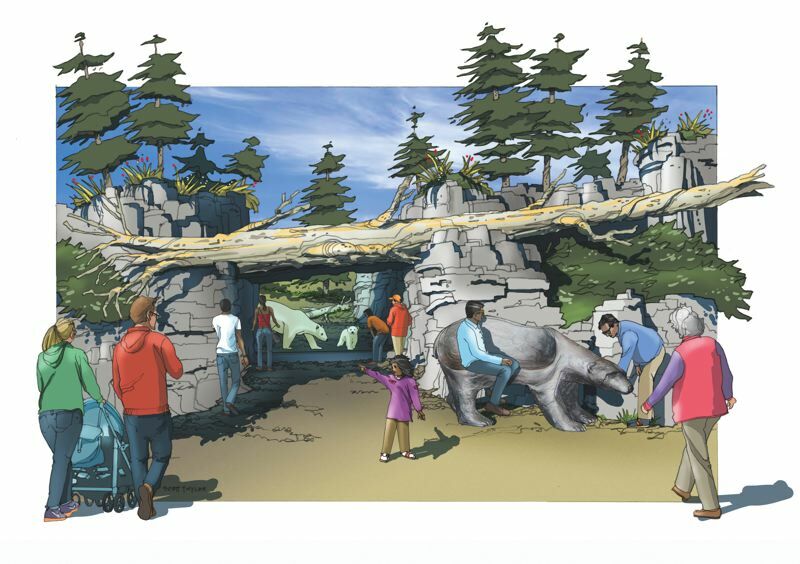 Ten years after voters approved a $125-million construction bond, the Oregon Zoo has entered a final round of projects. One decade after voters passed a $125 million construction bond, the Oregon Zoo is in the home stretch of eight projects to improve the lives of its animal residents and boost visitor experiences. Armed with a 20-year master plan, the zoo and its staff worked with project teams to build a new veterinary medical center and a new filtration system for penguins, create new habitats for condors and elephants, and open a new education center. 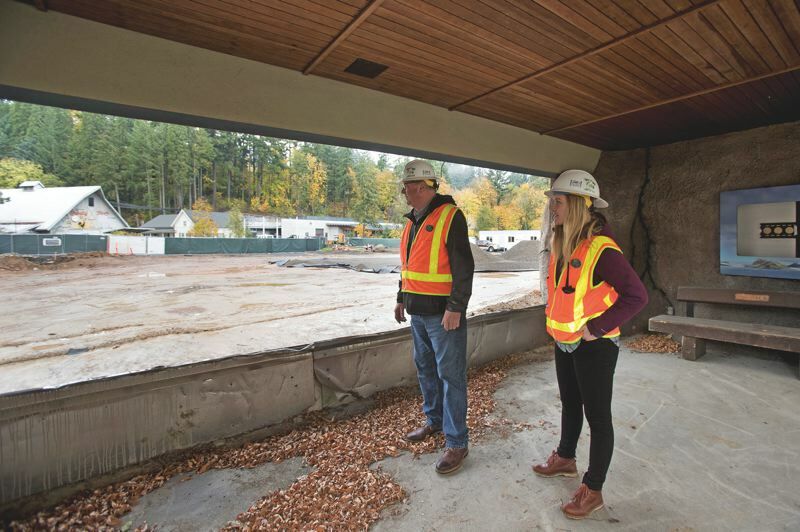 A final trio of projects, being tackled in one final swoop, will finish improvements to 40 percent of the zoo's Portland West Hills campus. An old primate building is being demolished to make way for a primate forest that will provide chimpanzees with an indoor atrium for meeting visitors face-to-face and two outdoor habitats. 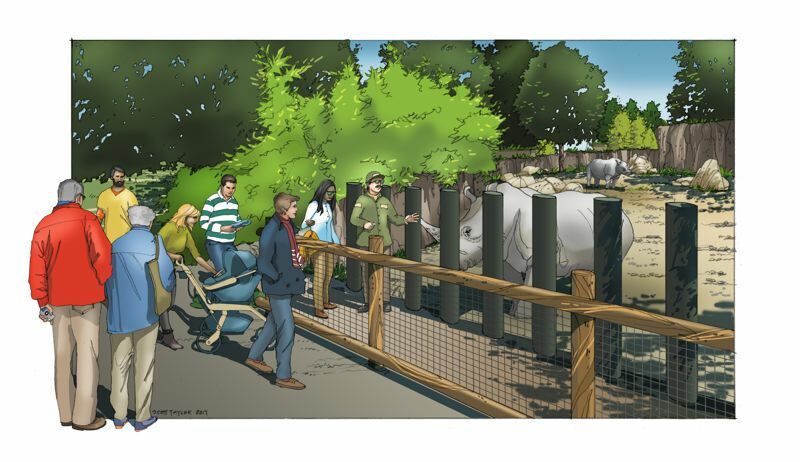 The zoo's black rhinos will enjoy a new habitat outfitted with an area that will provide opportunities for breeding. Meanwhile, the Polar Passage will provide polar bears with highs and lows in the form of mounds to allow for patrolling behaviors and a 12-foot-deep saltwater pool for diving. The habitats represent a trend in animal care that has taken root since the zoo's original animal areas were built in the 1950s. "For [the zoo], allowing animals to make a choice, to have dynamic environments — especially for chimps and polar bears — has been important," said Gregg Leicester, a principal with CLR Design. The firm, which is based in Minneapolis and has an office in California, has served as architect for the zoo's Elephant Lands as well as for the current trio of projects. Zoo projects tend to be more complex than other projects when it comes to meeting client needs. Rather than just a single owner, zoo projects are designed with the animals, the visiting public and the zoo staff in mind — in that specific order of importance — said Andy Dykeman, project executive for Lease Crutcher Lewis, which is serving as general contractor for the current projects. For the Oregon Zoo project, that hierarchy served as the guide when it came to figuring out how to keep the work within the costs of the bond-funded budget. 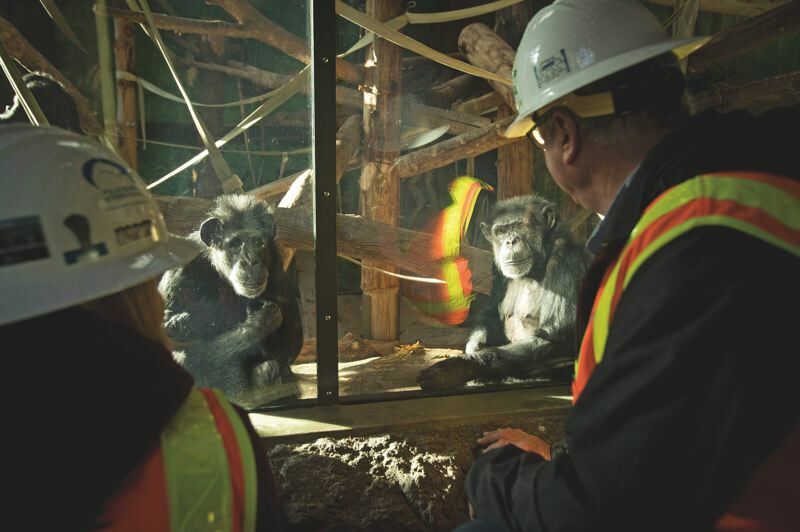 The rising cost of materials and labor since voters approved the bond means the zoo staff and the project team have had to be selective about features to keep — or toss out — for the projects. Saltwater for the pool for the polar bears, for example, was a without-a-doubt feature, zookeeper Amy Cutting, who oversees the polar bears among her responsibilities, said. "Saltwater is important for their eyes and skin — that's a new development in polar bear research," she said. But the system to clean and recycle the 135,000 gallons of saltwater, as well as the hot-dipped galvanized steel needed for the pool to stand up to saline-heavy contents, pushed up costs. So, the team looked for other areas that could be trimmed or adjusted. "We've been through quite a value-engineering process," Jim Mitchell, the zoo's bond construction manager, said. Plans to build out an area of the Polar Passage as a maternity den, for example, have been put on hold to cut down on costs. The area will simply be landscaped for now until money becomes available in the future. Cutting admits it's sometimes hard to have to trim some original plans, especially when the chance to design a new habitat can be a once-in-a-lifetime experience for a zookeeper. But having a way to prioritize helped make the decision process a little easier. "It's been a little painful," she said. "But I feel we've retained the things considered non-negotiable." When it comes to creating habitats as close as possible to those found in nature, the team from CLR Design spent hours researching the tiniest details of real-world environments for the zoo's polar bears, chimpanzees and rhinos. For the Polar Passage, imagery from along the Hudson Bay and taiga tundra areas were used to inspire the habitat vegetation and landscaping, including the overhang for the lip of the pool. "We look at those images," Leicester said, "and we say, 'How can we recreate that environment in Portland?'" Even the rocks in the exhibits will receive special attention. Although they'll start with rough materials — chicken wire and a fluid form of concrete called shotcrete — the finished surfaces will be works of art. "[We rely on] drawings, notes, tons of photos. We pay attention to everything from the size of cracks to the shade of moss to the actual shade of the rock," Leicester said. Creating a more natural, dynamic environment for the zoo's chimpanzees required the design team, especially the structural engineers at Equilibrium Engineers, to take an above-the-ground approach. 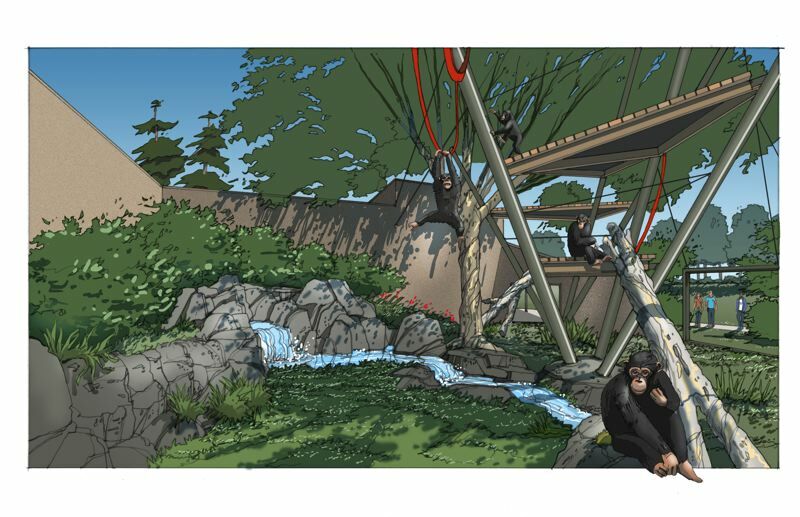 One of the two new outdoor areas for the chimpanzees will feature a mesh-enclosed structure that will soar 42 feet above the ground. Three steel masts will rise like the masts of a ship, strung with a series of cables and woven steel mesh. Platforms and ropes will allow the chimpanzees to climb and perch like in their natural environment. Zoo-industry standards that required that the openings in the mesh be no more than three inches created a conundrum, though. The zoo is in a zone where temperatures during colder months could result in snow and ice building up on the wires, adding as much as 100,000 pounds of extra force of tension on the structure, according to Ed Quesenberry, Equilibrium's founder. By using different gauges of cable, Quesenberry's team was able to create a stable enclosure that would be able to handle any additional loads resulting from wintery conditions while still allowing the enclosure to be transparent enough to allow visitors to watch the chimpanzees climb and swing. Quesenberry's firm paid attention to the nuts and bolts of the primate structures, literally. Chimpanzees have up to 10 times more strength in their hands and fingers than humans. That strength combined with the chimps' dexterity meant extra consideration had to be given to something normally as simple as how bolted connections are handled. When an earlier structure was built for the zoo's chimpanzees, their keepers realized the primates were able to remove the bolts with their hands. To avoid a similar problem, Quesenberry's team has come up with a simple solution. After bolts are tightened down, the construction team will weld the nuts so that they're fused down to the plates. "Otherwise, [the chimpanzees] will sit there and work with it and take the bolt out completely," Quesenberry said. The new habitats are slated to be open by fall 2020. 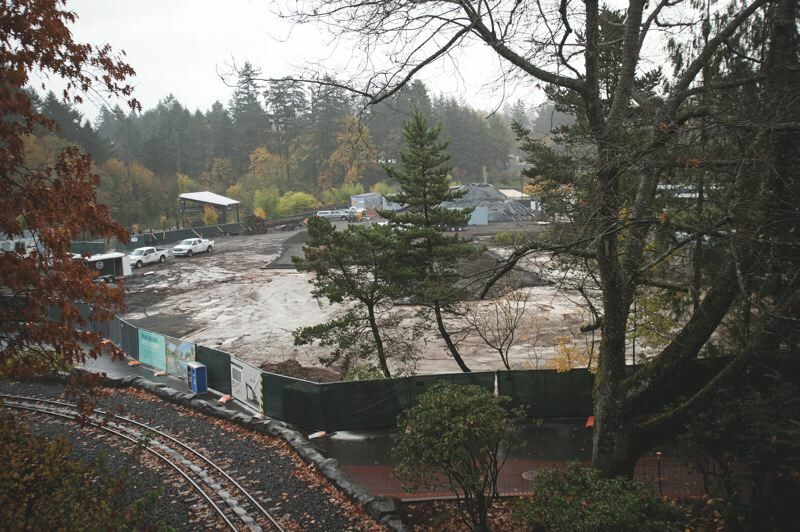 When Equilibrium Engineers handled structural aspects for the Oregon Zoo's Elephant Lands, a bond-funded project that opened in 2015, the firm had to deal with a small portion of land that was an active landslide. The firm encountered the same issue for the current group of projects, but on a larger scale. "The upper part of the zoo all sits on the ledge of an active landslide (area)," Ed Quesenberry, founder of the firm, said. Quesenberry and his team were tasked with finding a way to make sure the new buildings that will be constructed as part of the habitat projects, including support-system structures and a café, will survive if an earthquake occurs and the ground starts slipping. While there are ways to secure the entire area, they're far more expensive than what the zoo had in its budget. So, the engineers turned to a more affordable solution. Each building will sit on a mat made up of a 12-inch-thick slab of concrete. If the land starts to move, the mats — and the buildings on them — will move along with it. "They may be in a different location," Quesenberry said, "but [the zoo will] still have buildings."